One of the most spectacular homes on the water with 180 degree water views located in private desirable Point Beach offering elevator for your forever home with unbelievable low flood insurance. Smart home w/remote management of TV, Sonos sound system & LED lighting inside and out, HVAC, security system and all doors. 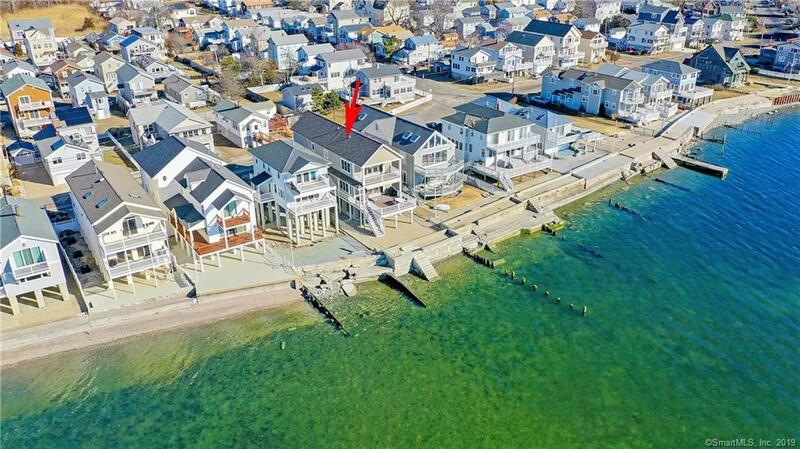 Enjoy sunrises, amazing sunsets, views of LI Sound and Charles Island. Featuring wall of glass leading to a 20x25 ft Azek deck, both upper and lower master suites feature decks and elegant bath/spas. Main level living room boasts with light and shimmering water views! Gleaming hardwood floors throughout, top of the line finishes, stone gas fireplace, ss appl, quartzite, marble counters, luxe master w/vaulted ceiling, deck w/panoramic water views, huge walk in closet/dressing room, bath heated w/travertine marble floor, his and hers steam shower w/body jets, jacuzzi w/lighted inline heater. Energy efficient gas inline tankless HW system, FEMA compliant, flood ins approx. $691 per year. 5 Min to downtown, shops, bistros, Metro North, I95, RT 15, 15 min to Yale, 75 min to NYC. Click on video icon to do a 3D interactive walk through tour.